Caucasian Scandal has had a harrowing run over the past couple of weeks, with President Donald Trump’s dismissal of FBI Director James Comey showing strong evidence of obstruction of justice, an impeachable offense. The string of revelations has optimists believing that the Trump administration—a redoubt for white supremacy plus Ben Carson—may finally implode. But for Haiti, the White House will not be exhumed soon enough. 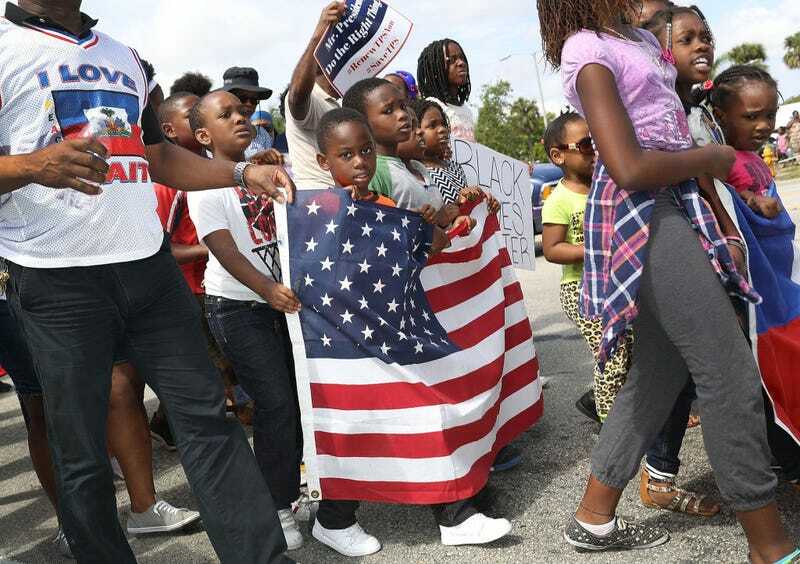 Tuesday is the deadline for the Department of Homeland Security to renew Haiti’s Temporary Protected Status before it expires July 22. The designation allows immigrants of countries suffering from armed conflict, environmental disaster or “other extraordinary and temporary conditions” to legally work in the United States. Haiti, ravaged by decades of violent political upheavals and poverty, was granted TPS status right after 2010’s catastrophic earthquake. The black nation has had one of the longest TPS stays in the designation’s history, but after a cholera epidemic and 2016’s deadly Hurricane Matthew again devastated Haiti, experts are calling for an 18-month extension because the country doesn’t have the resources to handle the potential deportees. The unapologetically xenophobic Trump administration has barely shown any capacity for compassion, and it doesn’t look as if DHS will lead a sea change. Early signs have been bleak: The Associated Press reported that a top immigration official requested crime data for the TPS-protected Haitians and data on whether they’re receiving public benefits for which they’re not eligible. Crime hasn’t been a focal point in the past when it comes to renewing TPS, and to use such stats as a basis to make more than 50,000 immigrants vulnerable falls in line with the draconian policymaking that’s been specific to Trump’s office. That the unfounded paranoia targets Haitians, however, is part of a long-standing tradition in U.S.-Haiti affairs. Since Haiti declared its independence in 1804, the U.S. has had a history of seeing the black republic as something to mold and subjugate for its patriotic, white interests. It’s the racist disrespect that’s in no small part responsible for Haiti’s continuous disarray. When Haiti won its independence from France’s enslavement, the European country got to work debasing the first free black nation. Citing the loss of property—essentially Haitians winning the right to their bodies—France coerced the nation into paying an equivalent of $40 billion. The U.S., itself a nation of proud slaveowners, was happy to comply with France’s cruelty, refusing to recognize Haiti until 1862 before granting bank loans in order to pay France. By the time Haiti’s debt was settled in 1947, it had become an atrophied land. Eurocentric extortion was also compounded by America’s insistence on occupying Haiti. The most infamous of those transgressions was the 19-year occupation originally ordered by President Woodrow Wilson in 1915 under the pretense that the U.S. was defending against German influence and restabilizing the country following Haitian President Jean Vilbrun Guillaume Sam’s assassination. The experience of Liberia and Haiti show that the African race are devoid of any capacity for political organization and lack genius for government. Unquestionably there is in them an inherent tendency to revert to savagery and to cast aside the shackles of civilization which are irksome to their physical nature. That self-interest-first, humanitarianism-second logic justified the U.S. role in the rise of François “Papa Doc” Duvalier, whose murderous regime (1957 until his death in 1971) led Haiti’s professionals and civilians to emigrate en masse. Marines trained and equipped the Tonton Macoute militia Papa Doc used to spread fear—he was all right by the U.S. because he was anti-communist. And, surprise, objectively horrific acts can be excused through racism. In a secondhand psychiatric evaluation of “Papa Doc,” the U.S. State Department Office of Medical Services noted that although his “paranoid personality ... approached psychotic proportions at times,” Haitians in general were a “paranoid” group unlike a “rational North American.” In other words, chaos is in Haiti’s nature, unlike its benevolent catalysts to the north. The United States’ pernicious influence includes its knack for usurping Haiti’s democracy on multiple occasions, as well as the flood of imported rice in the ’90s that put many of the island’s farmers out of business. Even U.S. efforts to help Haiti following the earthquake have been laced with numerous issues, including the misappropriation of funds and the Clinton Foundation-built trailers that are also health hazards. The very likely possibility that DHS is going to let TPS expire isn’t, at least on a surface level, as vicious as some of the United States’ other major 20th-century interferences. However, the ideology does continue a very cynical interpretation of American exceptionalism, where righteousness lies only in its own reflection. Within this construct, Haiti’s most damning sin is being black and free.